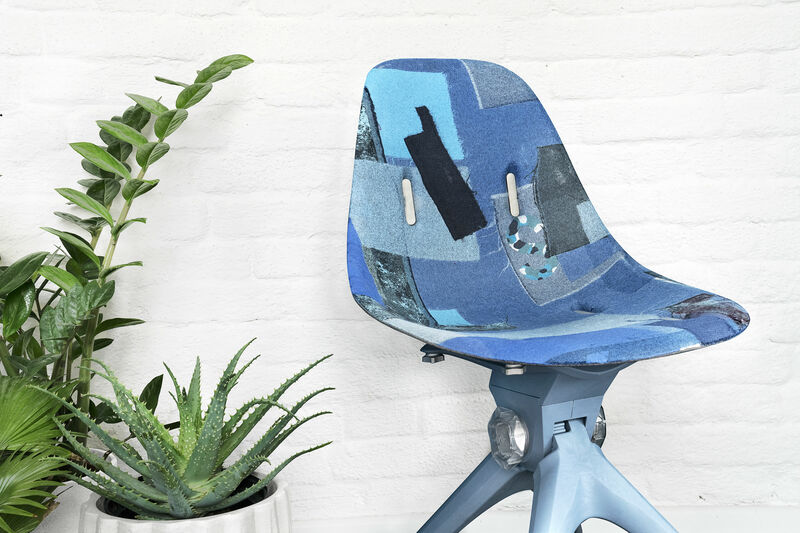 The only “truly” circular brand in the world, Pentatonic, have revealed their latest collection of upcycled products in a Parisian pop-up store. To mark a series of new product launches, upcycling technology and lifestyle brand Pentatonic have created a store unlike any other, called New Clothes. Launched last week, the eco-brand have taken over a gallery space called ‘The Supermarket’ in the heart of Le Marais, Paris and turned it into a pop-up store - where, for the next two weeks, Pentatonic will be showcasing their new products. New Clothes was designed with a simple objective: to demonstrate the extensive, stunning possibilities of re-engineering fashion waste. The unique technology that Pentatonic uses can re-generate synthetic fabric waste into new, raw materials. Taking waste from fashion products, this raw material can be used to create anything from a chair leg, new yarns, a seat shell and even 3D moulded felt. Since its launch at the London Design Festival in September 2017, Pentatonic has quickly established a reputation for being the world’s only “truly” circular brand; all of its products are made from post-consumer waste and are 100% re-recyclable. Everything is designed to be reinvented. Since launching, Pentatonic has used its technologies to target multiple consumer waste products and has upcycled them - including turning DVDs into tables, plastic bottles into cushions and mobile phones into glassware, all within the company’s first six months! “New Clothes is a clothes store, with no clothes – except everything is clothes,” the CMO of Pentatonic, Jamie Hall explains. What exactly does this mean? The answer was unveiled at the New Clothes Paris pop-up, which is a showcase of the brand’s new capsule collection; it includes cushions, accessories, coat hangers, and even chairs and tables. Pentatonic’s New Clothes launch is especially noteworthy in comparison to the brand's previous products; it marks the brand’s first collection that have been made using waste from the fashion industry. A blend of high-tech, hand-curation and fabric assortment makes up the process behind the creation of New Clothes. Beginning with sorting the fabric waste by colour, structure and material composition, fabric collages are created and transformed into functional objects through cutting edge thermal lamination and 3D forming technology. 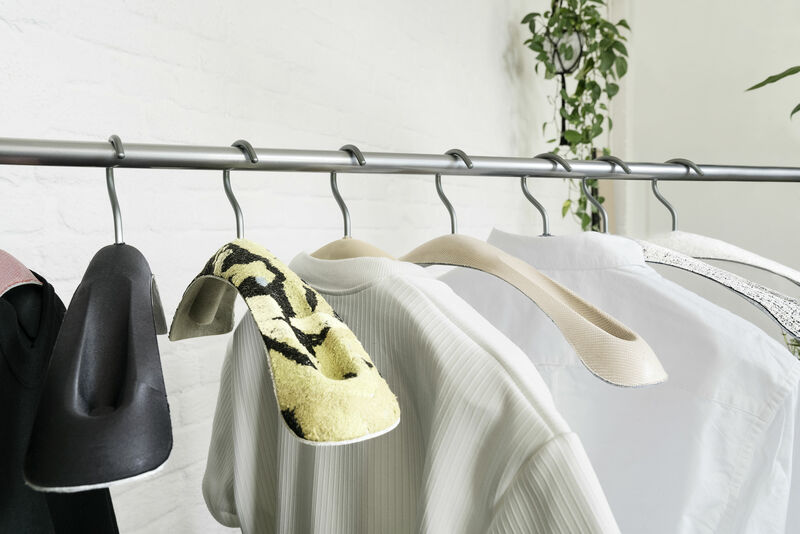 The main products within the New Clothes collection are the AirTool Chairs and Hangers, which are based around what Pentatonic call “three colour stories”. What makes the collection unique is that whilst it is made with world-leading technology, the pieces also display hand-crafted artistry in their finish – making many of the chairs and coat hangers one-of-a-kind pieces. Salvaged from multiple European sources, the collection has been crafted from fabrics that were once t-shirts, dresses, jackets, and left over design studio cut-offs. But Pentatonic’s process does not end with the sale of a piece from their New Clothes collection – the brand will also buy back used products from their customers to recycle into new products, creating an “infinite loop of creation and recreation”. The New Clothes pop-up store in Paris will also be showing the first preview of Pentatonic’s new ‘Fractured’ series, in collaboration with New York based design studio Snarkitecture, which launched last month. For such a young company, Pentatonic have really hit the ground running - we can't wait to see what they will upcycle next. New Clothes by Pentatonic opened last week, on the 6th of April, and will be on display in their pop-up store in Paris until the 22nd of April. All products on display at New Clothes are also available at Pentatonic’s website, here.